The documentary City for Sale and the book In Defense of Housing are perfect companions to demonstrate the broken nature of housing markets. A sixty-something Berlin real estate agent with ashy slicked-back hair and a thick German accent awkwardly cracks poor jokes while he gives a tour to two colleagues from London. The Londoners are on the hunt for their clients. One of them, the one with the permanent rehearsed smile, explains: “the typical clients we manage are international investors from the Middle East, Russia and Europe, and also celebrities. Lately, they have started to ask for Berlin because they see a lot of potential and it is the new artistic pole of Europe. They look for buy-to-let investments.” A little later he explains that most of their buyers actually look for two apartments, one to live in and one to rent out. Then he laughs and almost rips his face when he says it’s better to be an agent in London than in Berlin with property prices still three times as high, and so too the middleman’s commissions. The display feels very much like a scene from a badly cast comedy. Yet in fact, this embodiment of global residential competition is just one of the many simultaneously funny and toe-curlingly revealing parts of the documentary film City for Sale (Die Stadt als Beute) about Berlin’s housing market. Just as the documentary was released, the strikingly matching book In Defense of Housing by David Madden and Peter Marcuse was published. The book and the film are the perfect companions for anyone who wants to get a grasp of the housing crisis that currently exists in all big cities worldwide. In Defense of Housing outlines the contemporary attack on housing. That is, if your idea of housing is that it should provide a home for people in need of a place to live, the solution to the basic human need of shelter. Housing has instead become one of the primary drivers of global capitalism, through commodification and financialisation, making its function as real estate more important than its use as lived space. It is the result of spatial developments being market-driven. Madden and Marcuse: “housing is not produced and distributed for dwelling at all,” but “as a commodity to enrich the few.” The result, for millions of households, is anxiety, chaos, disempowerment, discrimination and oppression. For them – and this goes for people well into the middle classes – shelter, personal safety, and a sense of identity, order and continuity that derive from the personal ownership of property are at risk. The book provides an exhaustive analysis laced with examples from both sides of the story. On the one hand, the authors trace housing as a source of wealth and income for the lucky few. The most extreme cases being super-prime luxury homes, developed and bought as offshore investments, that are easily converted into money through loans, mortgages and complex financial transactions, with developers, investors and banks profiting. The heavily subsidised homeownership fetish of many countries is also criticised, just as far-reaching deregulation, the idea that rising housing prices are good, and the abstract financialisation of living space (“no doubt some canny financial innovators are already working on the securitisation of rent-to-rent housing or the pooling of income streams from subletting”). On the other hand, showing figures of numerous cities and countries, detailing destructive housing policies and describing chilling stories of people on the losing end of the game, Madden and Marcuse demonstrate how the growing perception and functioning of housing as real estate exacerbates both inequality and individual personal crisis. For people dismissing In Defense of Housing as anti-capitalist pessimism, for those who prefer a visual story, or for anyone interested in the urban housing game and its players, City for Sale is the documentary to watch. For four years, filmmaker Andreas Wilcke observed Berlin’s real estate market, following and interviewing key actors in the housing drama. The result is an astonishing mosaic story that has the power to amuse viewers and make them grimace, often simultaneously. All images are stills from the documentary City for Sale (Die Stadt als Beute). The film features investors, developers, real estate agents, politicians, residents, protesters and househunters, its mosaic edit illuminating the stark contrasts of the ‘dynamism’ of Berlin’s evolving housing market. Depending on who is talking, the same Berlin can suddenly change. One moment it is a vibrant, up-and-coming city that is getting prettier by the day, a perfect place to move to and invest in. The next minute Berlin is under pressure, losing its social and cultural face, and making it harder for people to find a home or even to survive. One act features a real estate suit explaining how he makes money on the typical Berlin Altbau houses: “I buy for €1200 per square metre, split the apartments, and sell for €1800 per square metre. All I have to do in the meantime is sit and wait for natural tenant turnover.” It transpires that this can be sped up, by offering sitting tenants a few thousand euros to leave. Elsewhere in the film, an investor candidly defines how he makes his return by ‘upgrading’ neighbourhoods: “Of course this is gentrification. I’m driving out income groups who can’t afford to live in Berlin-Mitte to move to the outskirts.” Conservative politicians and representatives of housing associations likewise explain gentrification as a wonderful development – a strategy even. Cut to the less fortunate, parallel reality, where landlord bullying and negligence are in full swing. A woman shows her apartment which, when she came home one day, was completely dark. 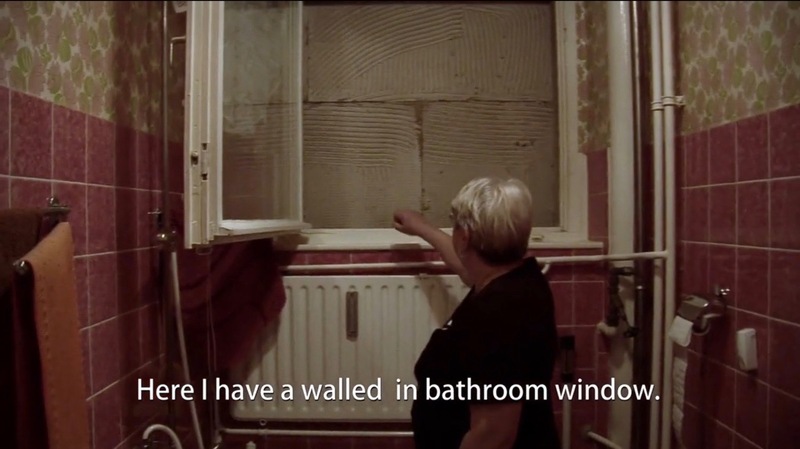 After she had refused rent-raising renovations, her landlord walled up the windows to her kitchen and bathroom from the outside, blocking ventilation and natural light. Another tenant is filmed in the ravages of her home. She also refused to move out, and while the entire building except for her apartment is now a construction site, renovation works flooded her flat, with no one able or willing to help. Elsewhere, a squat is being evicted and an elderly man explains how he can’t afford his rent anymore after it increased to €755 on a monthly pension of €1000. City for Sale provides many more of these scenes, both from the profiting and suffering ends of the spectrum. It shows how housing is increasingly reserved for people with the ability to pay for and make money from it, rather than for those in need of a place to live. A unique asset of the film is that it not only portrays the hardship of the losers in this game – it also offers a rare look into the dark matter of the housing market. Perhaps the fact that the winners are so blunt about their questionable ideas and practices suggests a general acceptance of the problematic housing system. But surely we can create an apparatus that is more satisfying to a larger part of the population? And are those playing the game and profiting from it really to blame? In In Defense of Housing, Madden and Marcuse take aim at the game and propose a fundamental transformation of the housing system. “People do not live in homes. They live in neighbourhoods and communities. They occupy buildings but also locations in a social fabric. A radical right to housing must affirm and protect this web of relations,” the authors write. They propose a broad overhaul of the current system that would ‘decommodify’ housing, democratise it and put it under control of residents again. Using international examples, recent and historical, and suggesting new instruments, they draw the contours of a situation in which a universal right to housing could be achieved. A situation that needs far more than some tax reforms, architectural ‘solutions’, a few new public tenement blocks, or a cooperative housing project for six middle-class families that looks good in design magazines. In Berlin and everywhere else, small innovations – however smart and well-meant – are often presented as quick fixes to the housing crisis, but such optimism obscures the dominant political culture that intentionally produces scarcity and enables exploitation. Luckily, in the midst of this disaster, City for Sale is also just a fascinating and entertaining documentary to watch.